There are times when even the most conscientious consumer may find they need debt assistance. The first thing to understand is that there is no shame in this. Occasionally, people need help finding out what their options are and how to best go about handling any issues that might have cropped up. The world is uncertain, so it is good to know that there are people out there that can help you get back on track. It is important to keep in mind that not all debt assistance may be the same. Typically, there are a number of different types of agencies that you may find yourself going to, each may have their own approaches to the way that debt can be made more manageable. Here are just a few of the options you have when looking for ways to repay a debt. Credit Counseling –This system is usually focused entirely on the debtor, helping them develop budgets, pointing them at educational materials and workshops, and generally guiding people toward making the life changes that they may need to in order to meet their obligations. Usually, after an initial session, there may be the need for follow up sessions to help you keep on track. Debt Consolidation – Debt consolidation involves taking out a loan to pay off smaller loans or debts. Sometimes this takes the form of balance transfers onto a new credit card with a 0% or lower APR. Another version of debt consolidation would be to take out a home equity line of credit and use that loan to pay off your others. Debt consolidation can help consumers roll multiple payments into one, typically at a lower interest rate or for a lower monthly payment making their debt a little more manageable. 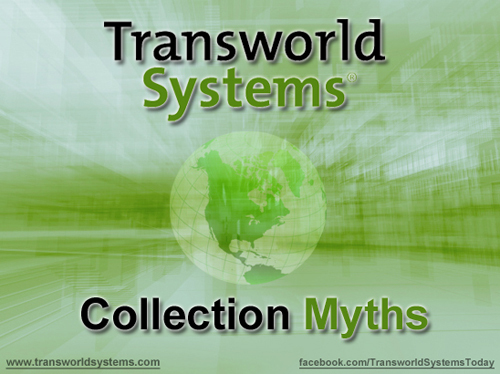 Working directly with the collection agency or companies you owe – A number of agencies like TSI (Transworld Systems Inc.), are there to provide assistance for people that do not know who they should talk to about setting up payments, paying off a debt that is owed, or requesting information about their debt. This may be a good way to start looking for solutions when faced with collection letters or calls. Most collection agencies are willing to work with you to find repayment options that work for you if you keep the lines of communication open. No matter what option you choose when looking for debt assistance, make sure to ask lots of questions. At TSI, our representatives are trained to provide knowledgeable consumer assistance and want to help in any way we can. We understand that debt can be crushing for anybody and may cause incredible amounts of stress for a person and their family. That is why it may be a good idea, if you are struggling with debt, to look at your options for debt assistance from TSI. Cash flow is the life blood of businesses and there are many businesses and practices that have cash flow problems. 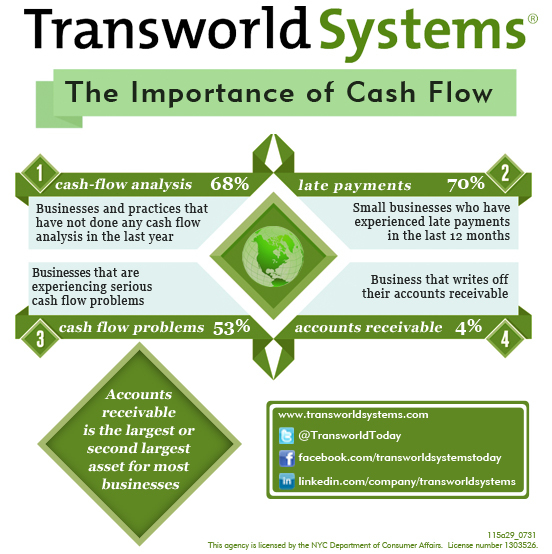 Since 1970 Transworld Systems has been working with small and medium sized businesses and practices to improve their accounts receivable and increase their cash flow! Transworld Systems can improve your accounts receivable and increase cash flow with Accelerator by recovering your money faster! Contact me today to learn more about how we can help you! ACA (American Collectors Association) International seeks to dispel commonly held myths about the credit and collections industry. Today more than 30 million consumers have delinquent or defaulted accounts under collection, averaging $1,400 each. As an industry, third-party debt collectors help employ more than 300,000 people, pay nearly $2 billion in federal, state and local taxes, donate $85 million and volunteer 650,000 hours to charitable organizations in local communities. “Whether a small town hospital, business or a city struggling to recover taxpayer owed dollars, organizations large and small rely on the recovery of rightfully owed consumer debt,” Morris said. Myth 1: Avoiding a Debt Collector Makes the Debt Go Away. Consumers who ask debt collectors to stop contact or choose not to respond to calls or letters often mistakenly believe it means their debt has been eliminated. Avoiding contact will not erase a debt. Instead, consumers should communicate with collectors to discuss the account, verify its accuracy and work on a plan for resolution. If consumers don’t owe the debt, communicating with collectors can help put a stop to calls or letters. Myth 2: Consumers Don’t Have Rights in the Recovery of Past Due Accounts. The collection of consumer debt is one of the most heavily regulated industries in the United States. Consumers have important rights under a number of federal and state laws. For more information about what to do if contacted by a debt collector please visit www.askdoctordebt.org. Myth 3: All Debt Collectors are Bad. Just as “all consumers” aren’t the same, neither are all debt collectors. Most are committed to professionalism, training and customer service. When it comes to the “bad guys,” we want to put them out of business just as consumers do. ACA International and its members continue to work with state and federal policymakers, regulators, courts and attorneys general to comply with the law and hold accountable those who do not. Myth 4: It is Boom Time for Debt Collectors. It’s no secret that consumers have struggled financially in the current economy. Despite an increase in defaults and delinquency, the inability of consumers to repay rightfully owed debts trickles down to those charged with their recovery.